Manchester City, decidedly not a Volkswagen-type of club, sent a big flashy car to the hometown of the car manufacturer to whisk away the local football team’s on-field leader and reigning Bundesliga player of the year, leaving behind a giant pile of money as restitution for ripping the heart out of team thought to be worthy of the word “contender,” even in a league that has an FC Bayern München in it. Just the distraction of Kevin de Bruyne’s flirtations with leaving the pack was enough to make the wolves look a bit less dangerous than expected. Wolfsburg took four points from its opening two matches, but neither the team nor player showed the form that led to last year’s firm second-place finish, much less worthy of talk of Wolfsburg potentially being a threat to unseat Bayern. Wolfsburg’s third match of the season was a win, which de Bruyne watched from the luxury boxes. Even though a transfer had yet to be completed, it was clear from his play on the pitch that he was not as interested in pushing Wolfsburg to great heights as he was in thinking about a return to the English Premiership, a hefty pay raise, and maybe even a bit about the prestige available to players at either of the Manchesters that doesn’t yet get splashed on players in Germany’s non-Bayern markets. In their first match after de Bruyne departed for England, the wolves played to a scoreless draw at FC Ingolstadt, a team promoted from last season’s 2. Bundesliga. The immediate analysis was to proclaim the result a portent of what Wolfsburg was going to look like without their diminutive Belgian enigma shelling out a whopping 21 assists and ten goals. The wolves dropped their next two road matches and drew at home to local rival and table-bottom Hannover 96 in-between the two losses, it seemed as if the post-de Bruyne Wolfsburg was going to serve as the poster child for the “England’s television revenue is going to ruin the Bundesliga” movement. 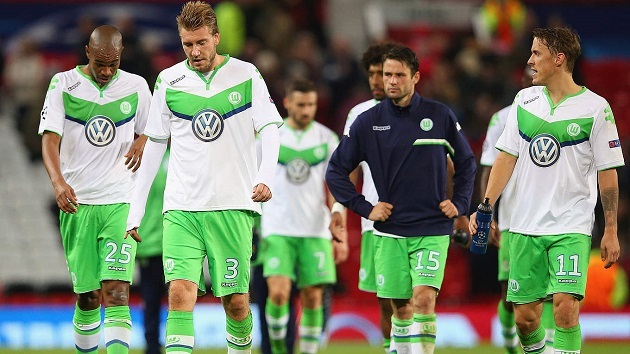 When last week’s international break hit, VfL Wolfsburg had dropped to ninth in the table, while jersey sponsor and main benefactor Volkswagen was far too busy dealing with non-football problems, managing an emissions-testing controversy that has brought such huge fines to the company that there is a widespread assumption that the car manufacturer will be forced to greatly reduce its financial investment in the club, which would likely spell the end of Wolfsburg’s run among the big dogs of German football and potentially see them headed toward the opposite end of the table. Then Max Kruse swept through the Hoffenheim defense in a 4-2 win Saturday and put a hush to all of it, at least for the time being. By no means was Wolfsburg immediately back to last season’s form, much less perfect, on Saturday. They blew a 2:0 lead to a team that has won just once and is now sitting 17th in the table, something that was clearly still on coach Dieter Hecking’s mind as he scowled in response to Max Kruse’s 3:2 in the 62nd minute and even as he kept the frown largely intact twenty-one minutes later when the summer transfer from Borussia Mönchengladbach completed his hat trick. 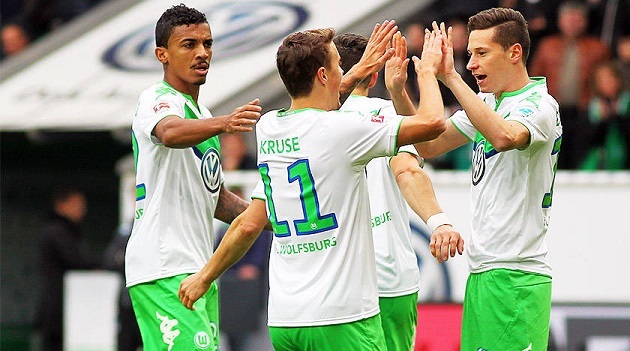 Even so, there is reason for hope in VW town via Max Kruse’s performance. It’s easy to point to a guy scoring a hat trick and proclaim he’s emerged as a new leader, which is something Wolfsburg needed to find with de Bruyne gone. For better or worse, the wolves’ play seemed to closely mirror the demeanor of de Bruyne. When KDB was in full-effect, Wolfsburg was going to win and likely in a convincing fashion. When the star midfielder looked annoyed by something, the wolfpack looked more like a VW microbus in need of a tune-up. Kruse’s three goals came as reward for a spirited performance that seemed to be the lift his teammates needed to revert toward form. Even Andre Schürrle reminded spectators that he was meant to be a big deal when he transferred from England last season. Whether Kruse can be the beacon for this year’s team the way de Bruyne was last season remains to be seen, but the truth is that it may not even matter. One of the things Wolfsburg sporting director Klaus Allofs did with the Bundesliga-record €74 million transfer fee paid for de Bruyne was to send nearly half of it to Gelsenkirchen in exchange for Julian Draxler, which seems to be paying off immediately. Draxler, still just 22 years old, was given a heavy workload at Schalke as a teenager during the 2010-11 season. A series of sales of more-veteran players eventually led to Draxler being promoted as the face of Schalke 04, which brought with it plenty of pressure on Draxler to perform. While it was clear he was a talented player, he never quite broke-out the way many had hoped for or even expected. In just five matches with his new club, Draxler is playing with the lightness of a man with a newfound freedom. He got in on the act Saturday with a pair of helpers to lift his assist total to four (putting him on pace to equal de Bruyne’s mark, for all you fans of small sample sizes). Kevin de Bruyne’s 2014-15 season would have been difficult for de Bruyne himself to repeat, so there is no sense in looking at a pair of newcomers and hoping either or both of them can replace that production, but when you look around at the returning talent from last year’s side, it’s easy to see how an inspired Kruse or a less-burdened Draxler could bring the pack back together for a return to the hunt, whatever they decide their ultimate prey this year may be.